Hi guys! TGIF! This has been a long and frustrating week for me so I'm looking forward to the weekend! My computer has been acting up since I stupidly upgraded to Windows 10 and then never I un-installed it before the 30 day trial was up so it wiped out all my Windows 7 files! Which in turn makes it so most of my photo and video programs I purchased years ago, and have been using for years, are no longer compatible for my laptop, ugh! This makes me extremely angry, like Hulk angry! Anyways, just wanted to let you guys know this so if you see a difference in my videos or have noticed I haven't really been posting many videos the past few weeks, this is why. I hoping to get this all resolved soon! Anyways, I have last weeks prompt as well as this weeks prompt for 40 Great Nail Art Ideas. I missed last weeks due to being sick but still wanted to make sure I did it whether it got put in the giant group collage or not lol So let's start with last weeks.! Last week's prompt was Job. I am a stay at home housewife, due to medical reasons I can't work, but I do own and run my own Indie nail polish brand CDB Lacquer from home so I decided to theme my nails around that. Here is my result! 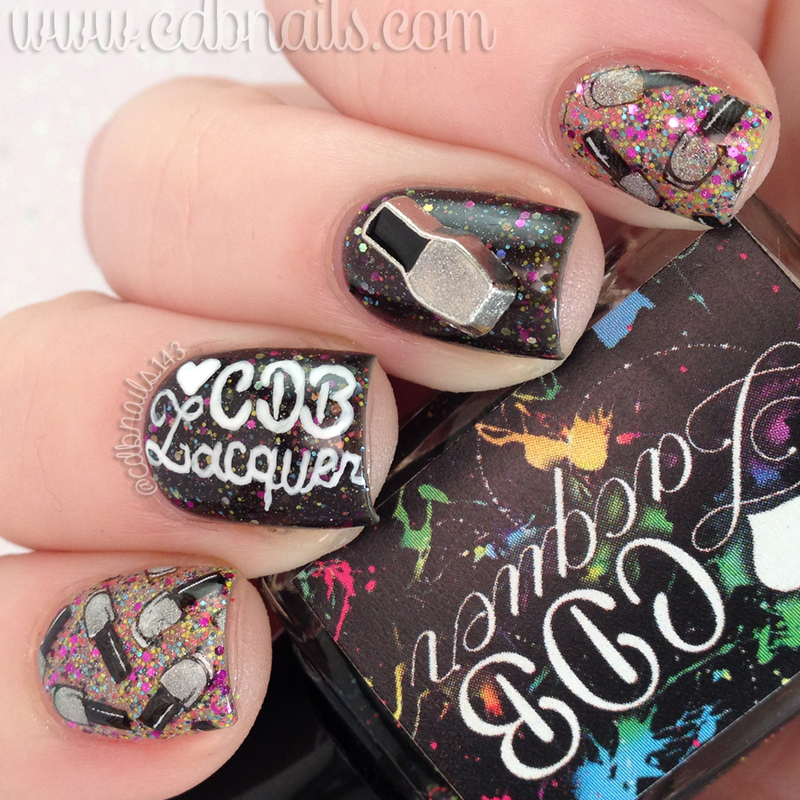 I used CDB Lacquers 1 year indie-versay polishes that were released last February. I then free hand painted my logo onto my middle nail with acrylic paint. I also got this adorable nail polish bottle charm from Supernails that was originally a very pastel pink but I painted it a CDB Lacquer silver prototype so that it could pretty much match any design I used it with. Stamping plate used is from Bundle Monster. And this weeks prompt is Grey with color and my pattern/technique was sponging. This was what I came up with. 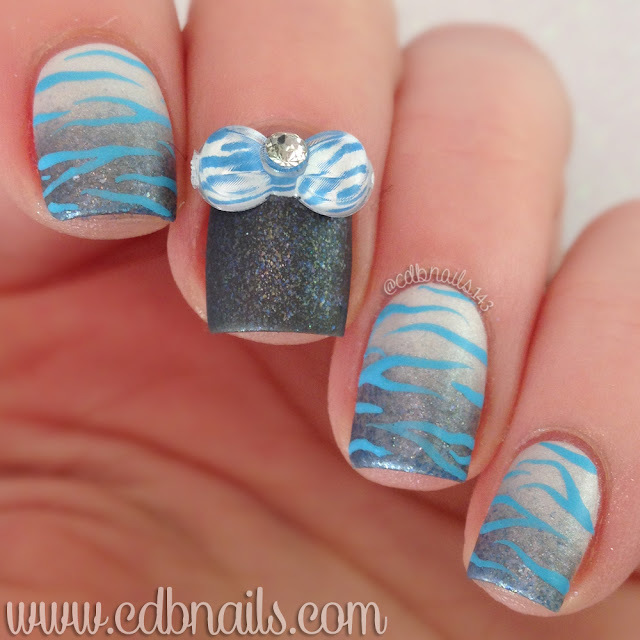 I did a simple grey to white gradient and free hand painted blue zebra print. Added the matching bow, which is actually what inspired this mani. That first look is so cute and I screenshot the second look to be inspired by later! Lovely manicure and the cute designs that you added! I know just how you feel i've also upgraded to Windows 10 and didn't make an back up and now i sit with the same problem! Windows 10 are the worst OS ever! Yesterday i had to restore my computer to an earlier time and now i can use my PC again, i will have to work on my PC in December to sort the major stuff out! Both looks are so adorable, and the blue zebra is so eyecatching! I really like both of these looks! You did a fantastic job with both prompts! Both of these are incredible! I especially love the second one! So sorry for the computer troubles! There is nothing worse than realizing you have lost something important. 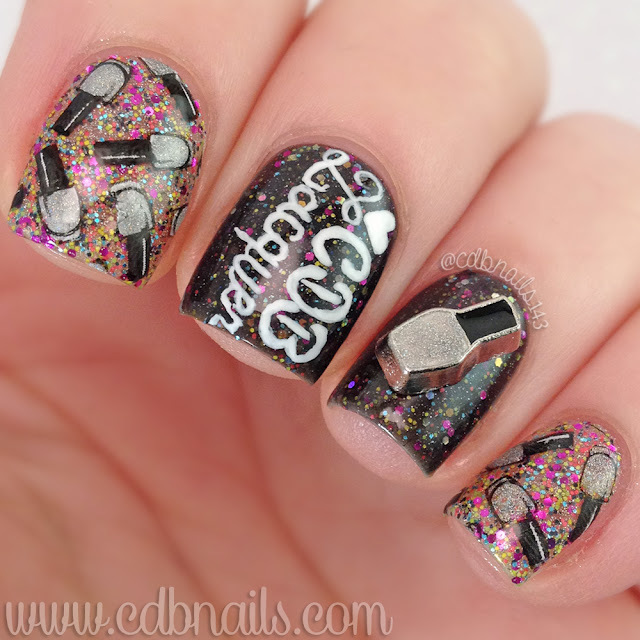 Nevertheless your macros are to die for on these manis!